Forgive me for sulking, but it’s a measure of my love for fresh corn that I can bemoan the passing of corn season even while we’re still in the midst of one. The three dozen ears Bev and I steamed, cut, and tucked away in the freezer are some consolation. But we all know that even fresh-frozen is simply not the same as summer fresh-fresh. At least we’ll go out in style with our Crème Frâiche Corn Quiche. The recipe is from my latest book, THE HARVEST BAKER, whose spine is getting more of a workout right now than a yoga instructor’s on a busy day. Tomato pies…Swiss chard galettes…blueberry cream cheese pound cakes – all of this fresh produce is like Christmas in July for us passionate home bakers. 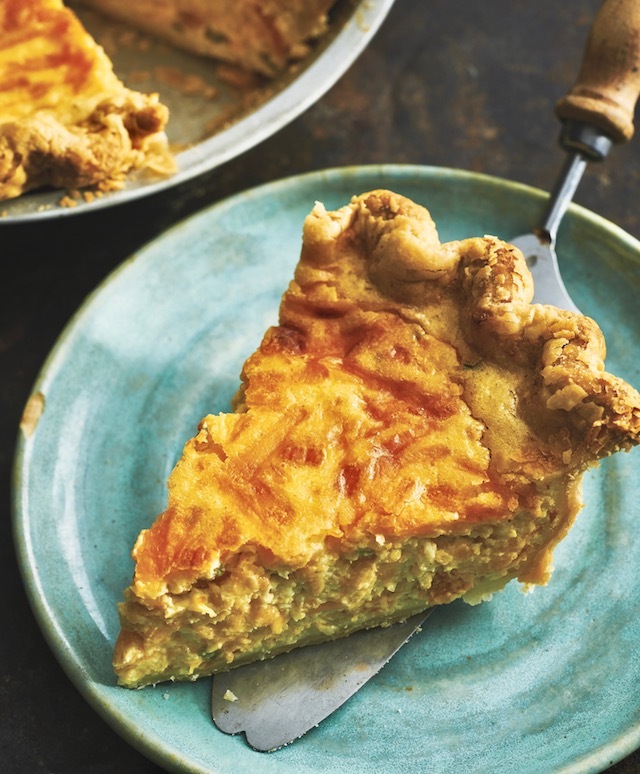 Our corn quiche is an impressive showcase for plump, sweet corn kernels. Part Southern spoonbread and part savory pudding, the crème frâiche gives it a tangy French accent you’ll really appreciate. It’s so rich, creamy, and satisfying, the only accompaniment you’ll need is a crisp salad of summer greens or a side plate of pickled vegetables. Maybe some sherbet or sorbet and berries for dessert. Incidentally, to keep the flavor as pure as possible I haven’t included any sauteed onions in this quiche, but by all means, add some if that sounds good to you. Enjoy! I realize you’ve been hearing crickets from my end these past few weeks. I hate to be out of touch like that, but I’ve been buried in the final edits of GREAT AMERICAN CREAM PIES, The Pie Academy’s new video course. The decision to move forward with a course on cream pies came about 6 months ago, after sending out a survey – perhaps you’ll recall – asking for your input on new courses you’d like to see at The Pie Academy. 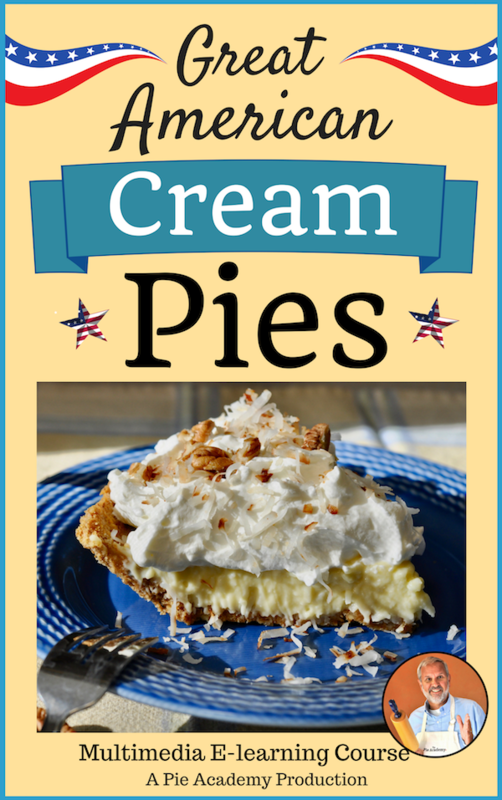 Cream pies, it turns out, was one of your favorite subjects and top picks. I’ve been calling this a “video course” but that really doesn’t do the new course justice. I prefer the term “multimedia course.” Without getting techy, the training is built on really neat software that allows me to post high-quality videos, audio recordings, downloadable recipes and guides, transcripts, and even quizzes right within the lessons. I’m in awe of what’s capable with this new system we’re using and it has me incredibly excited about the release of this course…and many others on the drawing board. I know you’re going to love the course, so I hope you’ll watch for the launch announcement in early August. PASTRY NOTE: If you don’t already have a favorite pie dough for a quiche, you will find a number of them by clicking on the RECIPES AND VIDEOS tab above and scrolling down to the pie pastry category. The Good Basic Pie Dough, or the Three-Grain Butter Crust are always great choices. Rich and creamy, with a little bit of tang, this is the BEST savory pie for showing off just-picked sweet summer corn. If you haven’t already, prepare the pie dough and refrigerate it for about 1 hour before rolling. On a sheet of lightly floured wax paper, roll the dough into a 12 1/2 - 13-inch circle. Invert the pastry over a 9 1/2-inch deep-dish pie pan, center it, then peel off the paper. Gently tuck the pastry into the pan without stretching it. Sculpt the overhanging dough into an upstanding ridge and flute, if desired. Prick the bottom of the pie shell 6 or 7 times with a fork. Refrigerate for at least 30 minutes or place in the freezer for 15 minutes. Preheat the oven to 375°F. Tear off a sheet of aluminum foil about 16-inches long. Carefully - so you don’t disturb the dough - line the pie shell with the foil, pressing it into the creases so it fits like a glove. Add a thick layer of dried beans, banking them up the sides. Bake the pie shell on the center oven rack for 25 minutes. Slide it out and carefully remove the foil and beans. Re-poke the holes if they’ve filled in. Slide the shell back in and bake another 8 to 10 minutes. Transfer the pie shell to a cooling rack. Once cooled, smear a little cream cheese or sour cream into the fork holes to plug them. Cool the beans thoroughly, store in a jar, and save them for next time. Set the oven to 375°. Combine the milk and cornmeal in a small saucepan. Heat gently, whisking almost nonstop, for 5 to 8 minutes, until the milk thickens to the consistency of heavy cream. Pour the liquid into a large bowl. Add the butter, mustard, salt, and pepper. Whisk until smooth. Put the corn in a medium saucepan with enough water to cover; salt lightly. Bring to a boil and cook at a low boil for 5 minutes. Drain and cool briefly. Transfer the corn to a food processor and pulse repeatedly, until the corn is roughly chopped. Combine the crème frâiche and flour in a large bowl. Whisk well. Whisk in the eggs, one at a time, followed by the thickened milk mixture and chopped corn. Stir in 2 cups of the cheese and the chives. Carefully pour or ladle the filling into the quiche shell. Sprinkle the remaining cheese on top. Bake the quiche on the center oven rack for 40 to 45 minutes, until it rises up noticeably and the top is golden brown, When you give the quiche a little nudge, it should jiggle as a whole and not seem soupy in the center. Transfer to a cooling rack. Slice and serve warm. Refrigerate leftovers. Reheat individual slices for 12 to 15 minutes on a baking sheet, loosely covered with foil, in a 300° oven. Note: Crème frâiche is a thick, cultured cream used in French cooking. To make your own, combine 1 1/2 cups heavy cream and 3 tablespoons buttermilk in a small jar. Stir. Place in a warm spot and let sit at room temperature for 12 to 24 hours, until thickened. (It seems to make little difference whether it's covered or not. Cover with a lid or cheesecloth if you prefer.) Refrigerate after 24 hours. Use within a week.